Oh, the joys of budgeting and forecasting! Few things in the business world can compare in complexity and stress-inducing powers. With so much involved in these processes—stakeholders, vendors, employees, technology, infrastructure—finding the right financial models for your organizational needs can be a huge challenge. But rise up to the challenge you must. Budgeting and forecasting lay the foundation for an organization’s fiscal health. Neglect them, and your financial forecast will be a gloomy one. Before we move onto our best practices list, let’s get something straight. Whether budgeting and forecasting are the same process or not has been a source of debate among financial professionals for years. Both are valuable tools when planning and grading a company’s financial health, but although they’re often used interchangeably, they complement rather than substitute each other. Budgeting is the process of creating a plan or estimate of costs, revenues and resources during a prior year to manage financial conditions and goals of the coming year. It works as a financial guide or planner. Forecasting compares the budget or plan to the current financial direction of the company to forecast whether the company will meet, exceed or fail to meet the expectations set by the budget. It attempts to predict future outcomes based on past events and management insight. In other words, the budget sets your organization’s goals, while the forecast defines its expectations. Both tools are necessary to run a successful business. CEOs and CFOs frequently struggle with how aggressive they should be when setting their budgets. They want to grow as quickly as possible, so they’re inclined to aim high. But if they aim too high, they can miss their budgets and lose face with their stakeholders. If they aim too low, they risk stagnation, lower valuation and leave the door open for competitors. How do you balance these two extremes? 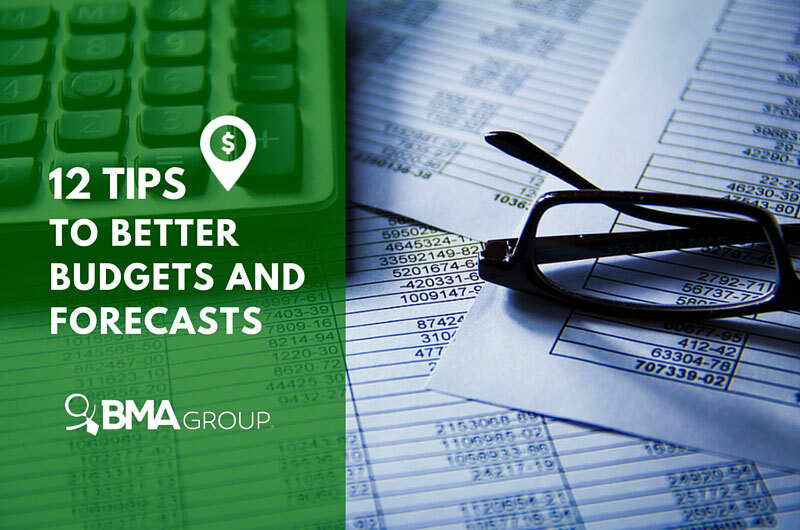 By following these 12 budgeting and forecasting best practices. What tools are you currently using? Are you getting the most out of them? Whether you’re using spreadsheets or any other budgeting and forecasting application, it’s worth your time and money to learn your system inside out—with all of its features. Excel users often stick to the tip of the iceberg, failing to take advantage of most (up to 95 percent!) of the package’s features. Features matter. Small changes can make a big difference in usability, accuracy and speed. Consider every use and every user. To be successful, budgets and forecasts need to reflect reality. Instead of being set in stone, budgets should be updated as frequently as needed to reflect economic, organizational and other outside variables. Static, multi-year budgets turn useless when faced with major changes or material deviations, particularly when a company hasn’t established an efficient process for evaluating the cause of these changes and adjusting the budgets and forecasts accordingly. Always consider the end product and needs from the outset while tailoring the approach and workload to reality. Counting rubber bands, paper clips and cellphones is a waste of time and unlikely to improve results. Using driver-based metrics you can budget laptops, for example, based on employee counts instead of counting each computer individually. Driver-based metrics are quicker, easier and more consistent, and they enable you to focus on areas where insight can actually improve business performance. Keeping your stakeholders happy is always a priority, but if your company is not meeting its budget and there’s no cash flow, you should tell your stakeholders. Then you can regroup and re-forecast to correct monetary issues, cut expenses, and grow the top line. Traditional line-item budgeting doesn’t adequately link financial investments to results or outcomes, limiting the ability for in-depth analysis and understanding of the real return of investment for a line of business or initiative. Consider implementing a performance-based framework that allocates resources to specific objectives or activities based on SMART metrics. This framework will provide increased visibility into how financial decisions translate into results. Budgets are often put together at the very last minute to meet artificial deadlines. It’s an annoying approach that in the end doesn’t accomplish much. The best budgeting process narrows broad goals into specific business plans and metrics through iterative group discussion, but only after initial metrics and numbers are generated by the groups responsible for each area. Successful organizations promote constructive communication and provide a narrative to support the numbers. Budgets are typically developed using the same account structure as the general ledger because that’s how they’re usually tracked. However, this approach fails at representing how the business is actually run. There are two additional structures a budget must contain: the planning structure, which identifies the major strategies and priorities to be executed, and the reporting structure, which describes how the business will change under different scenarios. All three accounting structures are necessary to develop and manage budgets. Traditional budgets are created based on requests from competing stakeholders, each justifying their projected expenditures based on their departmental needs rather than the overall goals of the company. This method eventually leads to an extended arbitrary decision-making process that can’t be objectively supported or justified. A performance-based evaluation framework helps establish concrete targets and priorities based on this year’s strategic goals and communicate those targets to all stakeholders involved in the budget process. It also enables the organization to make quicker decisions and minimize budget negotiation issues arising from competing interests and priorities. More details doesn’t mean more accurate. Too little or too much can hinder your budgeting and forecasting processes. Too much detail can cause an overload of information, slow down the process, and cause more technical errors, while a lack of detail while budgeting for large cost items or most volatile revenue components may lead to miscalculations and material errors. The best practice is to focus on detail where it matters and to plan in more detail for the short-term and less detail further out, unless your predictive capabilities are proven and your budget assumptions are not subject to volatility. In an unstable and sometimes volatile marketplace, drastic changes in resource levels, budget constraints and strategies are inevitable. A flexible budget that takes into account performance under alternative “what if” scenarios will serve your company better than one that ignores the future and invests too much time detailing the budget based on what happened in the past. Budgeting typically uses up 10 to 15 percent of a company’s time. It takes five to eight months to complete the full cycle in large organizations. The length of time a budget should take varies by the size and complexity of a company. The general rule of thumb is that your budget should take no more than 30 days to prepare. Otherwise, it will be out of date and irrelevant to current conditions before it has even been released. Using analytics technology can greatly improve the budgeting, forecasting and performance management capabilities of an organization. Analytics speed up the decision making process by making your data more accessible. It also highlights trends and exceptions, fosters a common understanding of the various drivers of performance and their relationship to future outcomes, and helps develop new insights based on the extensive use of data, statistical and quantitative analysis, and predictive modeling. Last year you probably promised yourself you would set aside time to fix your organization’s budgeting and forecasting processes so that this year they would run more smoothly. Did you? Chances are you didn’t, as most companies repeatedly break this promise. If you did, you deserve to be congratulated. If you didn’t, you now have an opportunity to not make the same mistake again. You cannot fix everything at once, but you can take small steps toward the best practices we just covered. Start with booking some time next January to stop what you are doing, think about it and make some improvements. You can do it. One step at a time.